One set of spot wood pallet machine for sale from ThoYu. And the spot price of pressed wood pallet machine is cheaper than other machines. The clients can get a 10% discount. The following is the detail. In addition, all the spare parts are free, and the client just pays freight only. The installation is also free. At the same time, ThoYu also provide the client with free maintenance annually. Thoyu pressed wood pallet machine adopts three-beam four- column with good strength and rigidity ability. The structural stability is increasing 75% than the former generation. And it solves the problem of the frame deformation thoroughly. The forming precision is increasing 50%, which avoids the rough and sharp edge and saves grinding labor cost. The service life of wooden pallet moulding machine is longer 80%, so creating much value for next 10 year. One start to produce one pallet, which avoids harm to main press machine and burn damage to pallet surface. Low cost and proper investment. 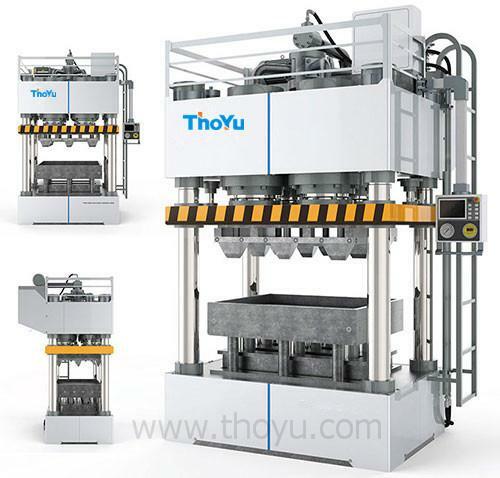 Pressed wood pallet machine from ThoYu engages simple process flow and high efficiency. In addition, the raw materials of the machine are easy to get, which low the production cost. A lot of raw materials can be produced into pressed wood pallet. They are anything contains wood fiber, such as wood chips, logs, timbers, wood shavings, waste wood, waste pallet, straw, and so on. The raw material price is lower than the traditional pallet machine. What’s more, wooden pallet moulding machine is the ideal equipment for recycling wood waste. You can send us email, if you are interested in our pressed wood pallet machine.